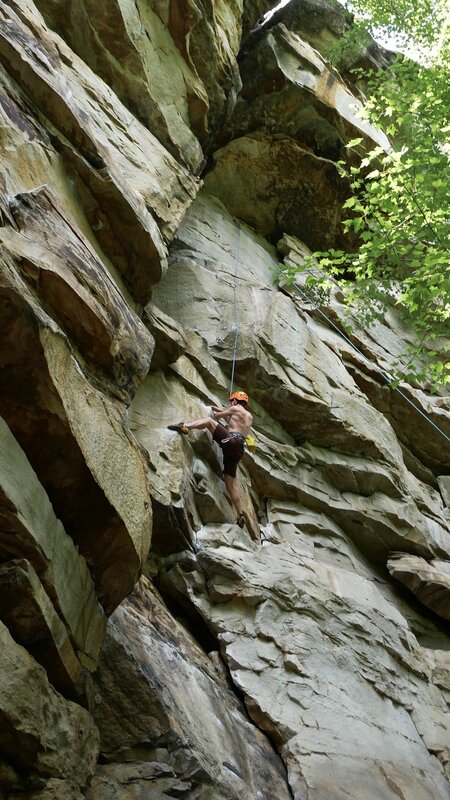 Today, my friends and I climbed at South Clear at Obed. We set out with the intention to climb trad at North Clear but the trail was really overgrown and we couldn't find the right routes. So, we went to South Clear and sport climbed. I only top roped this time. It took a while to adjust to the heights and being on a rope after bouldering in the gym. I climbed Best Seat In The House (5.9), Double Feature (5.10c), Shadowhawk (5.9), and tried Cheap Seats (5.10a) and Spawn (5.10b/c). Best Seat In The House and Cheap Seats were slabby climbs. I was sweating too much in the heat to deal with the small holds on Cheap Seats. We started on Shadowhawk and Spawn. These were both high climbs (90 feet) with great views of the river. I got worn out at the end of Spawn and didnt have the strength for the last few moves. Double Feature started with a cool boulder problem using a two finger pocket. The rest of the climb was big moves. Unfortunately, we all got yellow jacket stings on the hike in and out (they build their nests in steps on the trail). This was still a great day out.